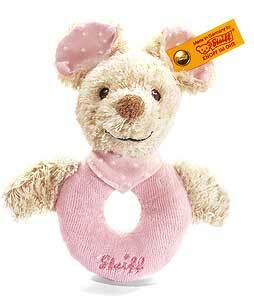 Steiff baby safe SNIFFY Mouse Grip Toy. Made of pale pink fluffy, certified organically grown cotton. Complies with Oeko-Tex standard 100, 12cm, with rattle. Machine washable.